Seismic Bag Deployment using a 3-Hook Carousel on a 100' or 150' "Long Line." Rupert's BAG RUNNER Seismic Bag Retrieval Specialist, 14,000 hour pilot. The Finest Helicopter Service Money Can Buy! We can TRAILER our HELICOPTER ANYWHERE IN THE WESTERN UNITED STATES saving you THOUSANDS of DOLLARS in Flight Time TO and FROM your Job Site. Click Here to visit our Helicopter Trailering Page. TERMS & CONDITIONS: We charge $5.00 per mile to trailer the helicopter. The job must be a minimum of 40 hours and 200 air miles from Vernal, UT. Click on each item below for more information about each service. Specializing in long line "SLING LOAD" Helicopter Service in support of SEISMIC OIL and GAS EXPLORATION. 600 - 800 pounds on the remote 3-hook carousel. FAA Certified Helicopter Charter Air Taxi Service. Established: August 1979. Safety first - we train your ground and flight personnel. Competitive rates & contract terms. Full passenger and general liability insurance. 14,000 hour helicopter pilot with A&P mechanic certificate. Helicopter Service for COLD WEATHER OPERATIONS ... NO PROBLEM! Wildfire rehabilitation specialist: seed and certified weed free straw broadcasting. Programmable F.M. radio in the helicopters & service trucks. "CARDED" to serve government customers. Wildlife survey and round up specialist. 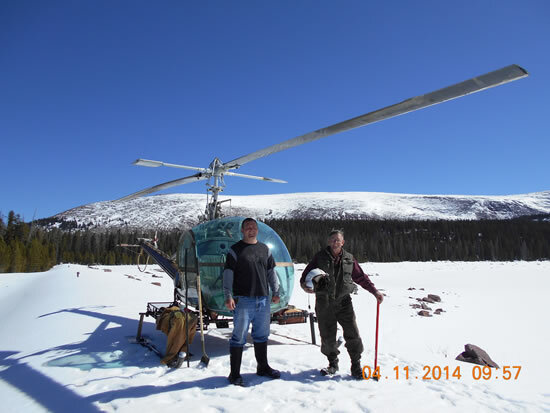 Aerial hunting & predator control. Fire fighting: Passengers, cargo, & Bambi Water Bucket. Search & rescue operations and training. Aerial photography, sight seeing, movie shooting. Aerial real estate reconnaissance charter. 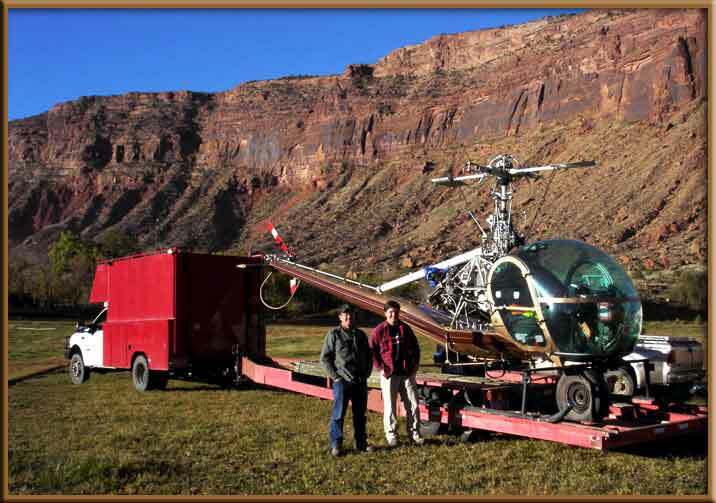 Helicopter Service area: WESTERN U.S.A.
We can TRAILER our Helicopter to ANYWHERE in the WESTERN UNITED STATES, SAVING you THOUSANDS of DOLLARS for Helicopter Flight Time TO and FROM your job site. Note: We are often out of town on flying jobs and NOT in the office to take your call. For Faster Response to your calls, please Call my Cell Phone or leave a message on my cell phone Voice Mail. For further information about our services, please return to the Top of this Page and click on the appropriate link or send us an email at jamesrichards500@Gmail.com. NOTE: When on working in the field, many times I can NOT receive Email for days at a time. For faster response, please leave me a message on my Cell Phone. 435.828.7710.